Five Brazilian policemen have been arrested after mobile phone footage appeared to show an officer placing a gun in the hand of a teenager they had shot dead in a Rio de Janeiro favela. The film, shared on social media, shows policemen standing over 17-year-old Eduardo Victor's blood-stained body. One of the officers appears to place a hand-gun in the dead youth's hand. Police say they had been attacked and acted in self defence, but the victim's family say he was killed in cold blood. The BBC's Wyre Davies in Rio says police in the city are often accused of administering arbitrary justice against those they consider to be criminals. A witness in the Providencia favela, or shantytown, told Brazil's Globo TV network that the victim had surrendered. "He was armed but he surrendered," she said. "After he raised his hands, they shot him." In the video - shot by a local resident - a policeman places the gun into the dead boy's hand and fires it into the air, possibly to give the impression that the boy had used it himself, our correspondent says. However, a lawyer representing the officers said they were emptying the gun to make it safe. In their version of events, police said the teenager was part of a gang that had attacked a police patrol in the favela. The five officers were arrested and questioned for allegedly altering a crime scene. Rio de Janeiro State Security Secretary Jose Mariano Beltrame issued a statement, condemning the killing and promising "exemplary punishment" for the officers involved. The teenager's funeral was held on Wednesday and some mourners carried banners condemning his killing. 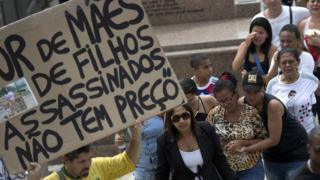 Brazil has one of the highest murder rates in the world with more than 50,000 violent deaths last year. About half of those killed are young black men and human rights groups accuse police of operating a policy of "shoot first, ask questions later". The police argue that they are often deliberately targeted by Rio's powerful drugs gangs, some of which are more heavily armed than the police.